Reuters writer Charles Abbott reported yesterday that, “The Senate must pass its $286 billion farm bill this week or wait until next year to vote on the package, which would protect farm revenue and expand food stamp benefits, Majority Leader Harry Reid said on Tuesday. Mr. Abbott added that, “If the Senate passes its bill this week, lawmakers would have three weeks in December, after a two-week Thanksgiving holiday recess, to agree on a final, compromise bill to send to the president. Philip Brasher, writing in today’s Des Moines Register, indicated that, “Chances are fading that the Senate can finish its $286 billion farm bill before December. “The Senate formally took up the bill Nov. 5, but on Tuesday Democratic and Republican leaders were still trying to agree on which amendments would be allowed for consideration. Mr. Brasher added that, “Because of the dispute over the farm bill, the Senate chamber was quiet for long stretches of time Tuesday afternoon. “The American Farm Bureau Federation and organizations representing soybean, cotton, rice and sugar growers wrote senators Tuesday urging them to pass the bill. And Brownfield’s Julie Harker noted yesterday afternoon that, “With the Thanksgiving break coming up, Senator Chuck Grassley of Iowa says work on the Senate Farm Bill might not happen until December if an agreement is not reached today on the procedure for farm bill amendments. To listen to a FarmPolicy.com audio recap of yesterday’s Senate activities, which includes floor excerpts from Sens. Reid, Harkin, McConnell and Chambliss, just click here (MP3- about nine minutes). Also on the Senate floor yesterday, Sen. Kent Conrad (D-ND) took issue with an article that was published in yesterday’s Washington Post regarding the Senate version of the 2007 Farm Bill. To listen to FarmPolicy.com audio containing Sen. Conrad’s comments on this and other farm policy related issues from yesterday, just click here (MP3 about 12 minutes). Meanwhile, The Wall Street Journal editorial board stated in today’s paper that, “Perhaps it’s beneath the dignity of Members of Congress to shop at a grocery store, but if they did they’d know that food prices are rising faster than at anytime in 17 years. Milk now costs $3 a gallon in many states. Eggs, oranges, peas, tomatoes and rice are selling at or near all-time highs. The biggest winners have been corn producers, as corn prices have doubled in two years — thanks in part to new mandates for ethanol. “All of this is translating into the best gains in farm wealth in decades. 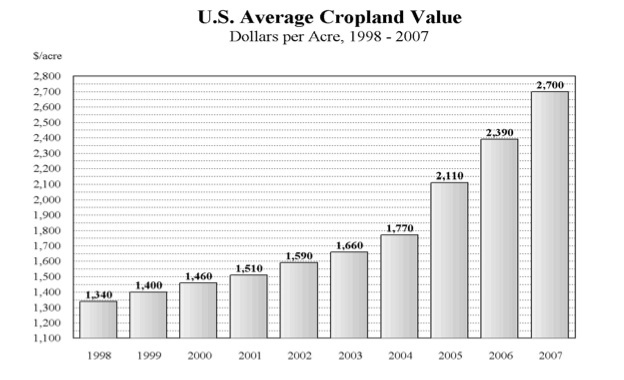 Total farm income is expected to leap by 44% to $73 billion this year, according to the USDA. The average income of full-time farmers hit $81,420 last year, with large corporate farms earning in the millions of dollars. Meanwhile, farmland prices in the past five years have increased by $200 billion a year, or an average asset gain of $100,000 per year per full-time farmer. “Mr. Conrad chairs the Senate Budget Committee and fancies himself a ‘deficit hawk.’ His farm bill nonetheless makes a mockery of his ‘pay as you go’ budget rules by using bookkeeping gimmicks to create fictitious savings. Some $10 billion is ‘saved’ by moving farm payments just outside the official five-year budget window.